If you are searching for “cooling tower float valves“, “cooling tower fill valves“, “cooling tower float switches“, “cooling tower makeup water float valves” or “cooling tower float assembly“, Cooling Tower Products can help! Float valves and float switches are essential for maintaining proper water levels inside a cooling tower as well as other types of liquid/water storage tanks. Float Switches are used in cooling applications that rely on air to water contact, constant water flow, and water level management for proper evaporative cooling. 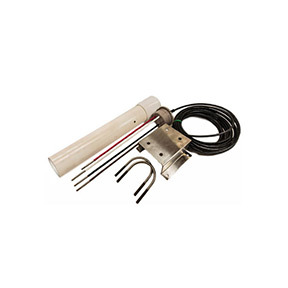 These electronic float valves / water level controls help to ensure a long life for your cooling tower with minimal maintenance by regulating make-up water. Complete kits are available and include float arm(s), float-in kits to fit specific applications, and float valve(s). 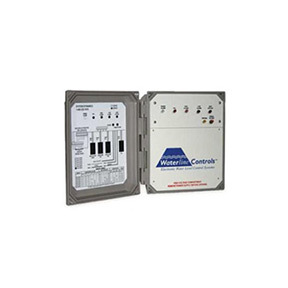 Electronic float switches and water level controls are perfect for controlling the fluctuation of water inside of your cooling tower and maintain maximum efficiency. These electronic float assembly’s are made to replace electronic float switches inside Marley, Evapco, and BAC cooling towers. 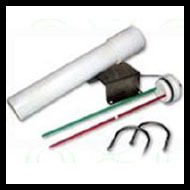 Our float valves and float assemblies are designed to replace float switches altogether. The problem with old float switches is the fact that they foul, plate and deteriorate. Our float switches are built with stainless steel rods to prevent this. Furthermore, all electronics are built into the head for quick and easy installation in any Marley, Evapco or BAC cooling tower. Our cooling tower float switches can manage makeup water levels, turn high and low level alarms on or off, start or stop a water pump and more. 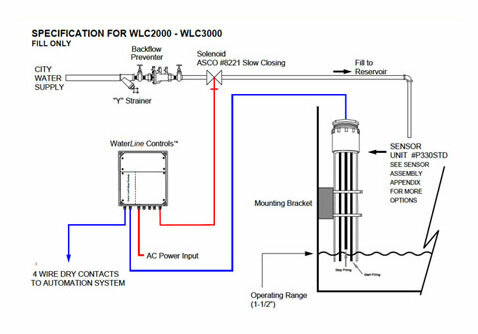 Our float switches regulate how much makeup water is in the cooling tower controls the water level to ensure consistent operating levels automatically. This float switch controls water solenoid valves remotely. When the level of water gets lower or higher than the predetermined limit, the cooling tower fill valve opens or closes to put water back to normal operating levels. High & Low water alarms are used to give a warning about high or low water levels. The signals are sent to dry contacts that light up LED alarm indicators to let you know when the system needs corrective action or can be used to automatically start or stop a water pump. All electronics are built into the head of this cooling tower float switch. The low water cutoff optioin is used to stop pumps from pumping water when low water levels are detected. This switch is used to shut the pump off when left unattended. This prevents costly water pump repairs. Dry contacts may also be used alongside pilot duty controls or digital control systems to shutdown the equipment that needs water during no water or low water situations. There will be some necessary testing and calibration of the valve in order to balance the cooling tower operation with the make-up water. The water level (at pump start-up) requires the valve to be deep-seated to be able to create strong pump suction. The setting of the valve should ensure that no water is wasted by the overflow at shut down. Adjust the wing nuts of the valve to make sure the make-up valve is all the way shut when the water level gets to be a half of an inch below the overflow connection. These settings will produce similar operating levels to those shown in your Operation and Maintenance manual. See the manufacturers’ suggested operating levels in your manual for a proper configuration. You can begin operation once you have set the bleed rate and the desired cycles of concentration. Please note, it is always a good idea and recommended to let the system run for 24 hours or so before you make any re-adjustments. All sensor rods are made out of stainless steel and color coded to make for easy installation and alarm connection. The colors of the rods correspond to the output of the float switch. Rods can come in different lengths and extension kits can be purchased for custom applications.